Prior to the concert, the grass area fills up with people with picnics and wine. You can't bring in your own adult beverages but there is a bountiful supply of Mondavi wines for sale. Last weekend, Christine and I lucked out when some friends said they had extra tickets for a concert at Robert Mondavi winery. 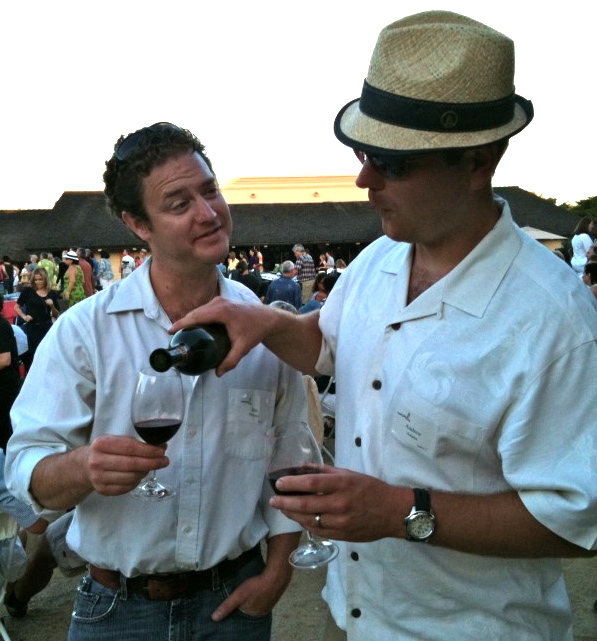 The Mondavi concert series is a long-standing Napa tradition and the concerts are always a sought after ticket to spend a pleasurable summer evening. Our friends, Ben and Tracy, work at the local Napa radio station that is one of the sponsors of the concert series. So not only did Christine and I have the privilege of free tickets to a show but we also snagged seats at one of the premium tables where the wine flows free and plate after plate of gourmet food is brought to you. Back when Christine was in her early 20s she used to make extra cash by working as a server for the VIP section. She was thrilled by the chance to enjoy a concert from the other side of the table. Because of all the free wine (which pours freely, did I mention that?) the crew decided to cab it up valley and back. Without anyone having to worry about driving we were all able to sit back and enjoy the show. We came early to also enjoy free wine and appetizers for VIP guests before the concert. While we sipped chilled Chardonnay and nibbled on snacks we were also able to wander around large oak fermentation tanks and the winery’s modern and impressive barrel room. 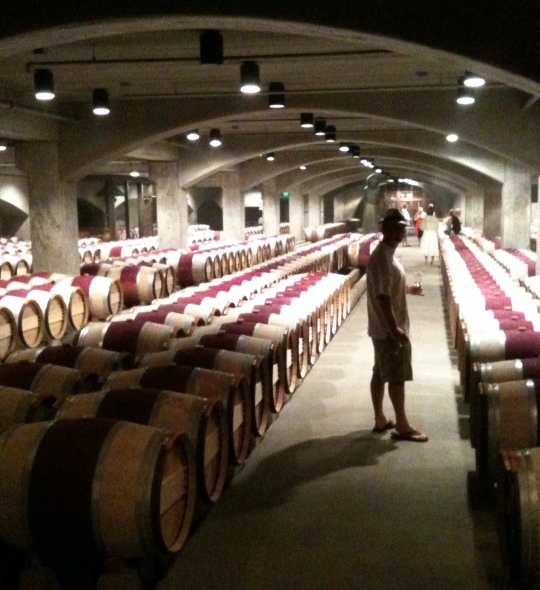 As a cellar rat, I love to visit other winery’s cellars to look at what type of equipment and layout they have. I would love, love, to work with barrels that are always laid down one high. At Starmont I often have to scramble up barrels stacked five or six high. I think because of Mondavi’s long history in the valley and its acquisition by wine behemoth Constellation, people just don’t seem to give the Napa winery the respect it deserves. The wines may not have the hipness or cult following of other Napa wineries but they are all well made and taste great, if not amazing. Although at dinner, we did enjoy a library Cabernet that was very good. Following the pre-concert reception, we made our way out to banquet style tables adorned with lovely table settings and situated beneath vine covered trellises. 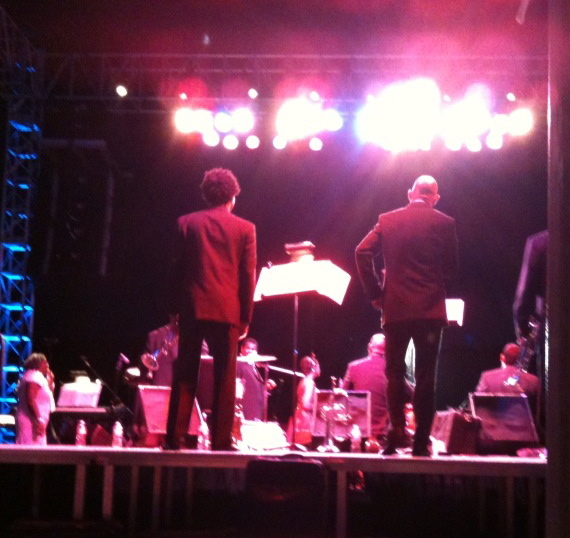 Performing that night was Juan De Marco and the Afro-Cuban All Stars. Apparently the lead was a member of the Buena Vista Social Club and the band had the same fast-tempo style jazz. In keeping with the Cuban theme, the night’s menu included several Latin dishes as well as delicious braised Cuban pork. For wines we enjoyed the famous Mondavi Fume Blanc as well as a solid Carneros Pinot Noir and an especially tasty 1999 Reserve Cab. I’m not going to pretend I’m a huge Jazz fan so I can’t say the music was wonderful or bad, I did enjoy it though. The snazzy beats had most of the folks in the grass area up and dancing and even had Christine dragging me around the table area in an attempt to get me to dance. An attempt though, I’m a terrible dancer. What I really enjoyed was just lounging in the VIP table area taking in our great view of the stage and performers. It seemed about every 10 minutes a prompt and courteous server was at our elbows asking if we needed more wine or food. And, I’ll be honest, we were grateful and accepting of the generosity. 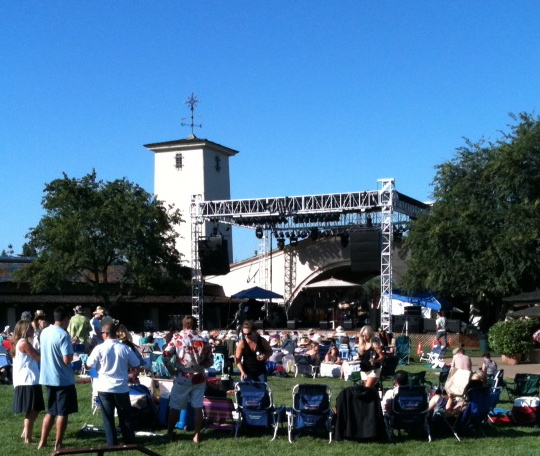 The concerts at Mondavi have been going on for more than 40 years now, and I can see why. The food is great and there are few better ways to enjoy a spectacular sunset over the vines of Napa Valley than with the accompaniment of skilled musicians. Tickets are pricey (table seats average $200) but the lawn tickets are a bit more reasonable. A rear view of the performance. I know it's not a great concert shot, but it would have been an impossible to have made my way through the jammed lawn area to reach the front of the stage.